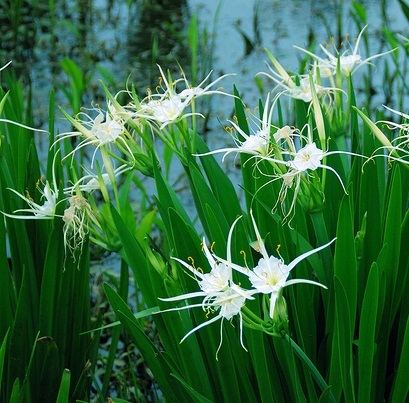 Hymenocallis or often called Spider Lily is Amaryllis plants that contains 63 species native to tropical and subtropical America. Hymenocallis means "beautiful membrane" in Greek, referring to the staminal ring that connects the stalks of the stamens of a portion of their length. The plants have large spectacular flowers. The flowers have their stamens united into a crown feature. 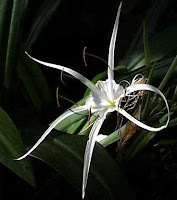 Hymenocallis have long thin segments radiating from a circular center, giving the whole flower look like spiders, that's why it's known as spider lilies. The flowers has delightful scented fragrant with up to 8 flowers in each flower stem at a time. 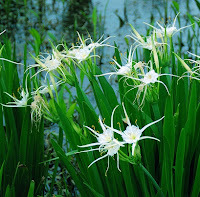 Hymenocallis flowering in mid summer roughly between May to June. This bulb -similar to a daffodil- can reach 18-24 inches (45-60cm) in height. Hymenocallis does best in full sun or very light shade. Planting bulbs in fall with the neck and shoulders above the ground. Grow on a soil-based compost in bright filtered light or full screen. Provides low humidity for deciduous species and moderate to high humidity for evergreens. In areas where the soil is not frozen, Hymenocallis be a member of the spectacular summer terrace garden. They loved good drainage and grows well in soils rich in organic matter.